LUCKY LURE TACKLE is a real full service fishing tackle store located in Oklahoma City, OK. We provide quality name brand and specialty products for the avid to amateur fishermen. We are an independently owned and operated providing great selection, more colors, competitive prices, unique products and personal service to our customers. This website has just a small portion of the products we offer in our retail store. Check our site regularly as we add additional products. If you don't see what you are looking for please contact us. We may have what you need in stock or we can search for those special items from our numerous product suppliers. Please call us for any additional information on products and services we provide or can assist with! WE WILL GLADLY SPOOL YOUR REEL PURCHASES WITH TRILENE XL or XT MONOFILAMENT LINE FOR FREE! Tell us which Reel, Type of Line, Color and Pound Test you need. We accept Mastercard, Visa, American Express, Discover, and Paypal Payments. Open Monday thru Saturday 9:00am to 6:00pm Weekdays, Saturday till 5:00pm. 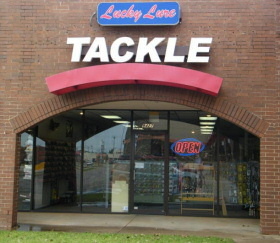 Located in Oklahoma City, Oklahoma, Lucky Lure Tackle is a full service fishing tackle store located in the corner of the Britton Square Shopping Center on the Northwest corner of May Avenue and Britton Road. We sell Fishing Rods, Fishing Reels, Fishing Lures and Bait. 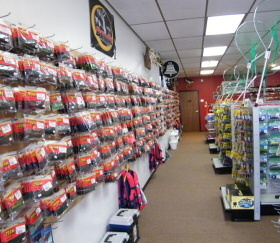 We provide Fishing Rod and Reel service and spool reels with line. We carry products from many major and local manufacturers. 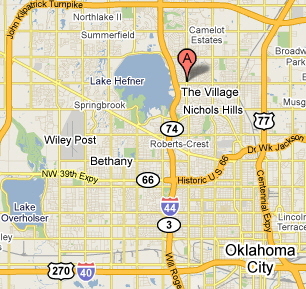 Driving Directions: At the Lake Hefner Parkway and Britton Road intersection go east just 1/4 mile and turn left into the shopping center (at the chinese restaurant) just before you get to the May Ave.and Britton Road intersection. The store is located in the corner of the shopping center.